Before I make wild claims like the one I made on October 22, where I said "flex_ws_api now supports SOAP 1.2" I probably should have tested the code against a SOAP 1.2 service. I can now say that I have tested it with a SOAP 1.2 service and I learned a couple of things. Firstly, when setting the content-type header, the action must appear after the charset declaration or you will get an unsupported media type error from the service. Secondly, there may be an occasion where you have base 64 encoded character data and you want to convert that into binary data, for example, providing the ability to download a document. Based on these two findings, I have updated the flex_ws_api code available below to set the content-type header properly and added a function called clobbase642blob that takes in a base64 encoded clob and returns a blob. The services that I tested with are the Oracle Beehive web services. Oracle Beehive "is a collaborative environment built on a unique model that combines the various communication and coordination services into a comprehensive platform." You can test these services via an HTTP interface which came in very handy when I needed to know the structure of the SOAP 1.2 envelope that each service expected. The services that I interacted with were the WorkspaceService to get a list of folders in a workspace and the DocumentService to get a list of documents in a particular folder. The application I built was a simple three page application. 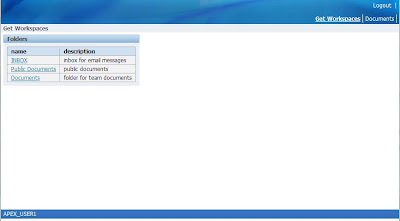 The first page showed a list of folders in the workspaces that the logged in user belongs to. Each folder linked to the second page which would then show the contents of that folder. Each document linked to the third page which has a before header process that downloads the document. 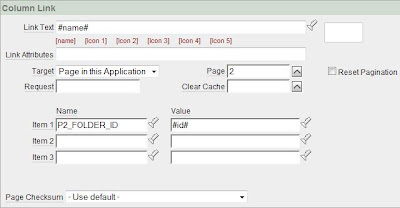 Start by creating an Application Express application with one blank page. Make sure you have compiled the new flex_ws_api in the schema associated with this workspace. Call the blank page something like Get Folders. The first thing to do is to create a before header process on the page to use the flex_ws_api and call the WorkspaceService, operation GetWorkspaces based on the currently logged in user. See the code listing. One thing to note about the process above is that we are passing the username in the envelope using :APP_USER to reference the currently logged in user. Whatever authentication method your application uses will have to also be a user in the Beehive world. The second thing to note is that the password is hardcoded to Welcome1. You will obviously need to change this to be dynamic and based on the user. Finally, we are storing the response from the Beehive service in an Application Express collection called GETWORKSPACES_RESPONSE. Now that the page has a process to call the web service you create a report region to show the folders in the workspace for this particular user based on the web service result. You do this by writing a query that first casts the clob001 column in the Application Express collection to an xmltype and then use the table command to shred the document. See the code listing. One thing to note is that the id column might contain colons and slashes, so the report calls wwv_flow_utilities.url_encode2 to encode these characters. You will modify this report slightly to hide the id column and then link the folder name to page 2 which makes the encoding trick necessary. You first create page two. Page two of the application calls the DocumentService and the GetDocumentsInFolder operation based on the value of a hidden item to hold the ID of the folder. First create a new blank page (page 2). Add a before header process that uses the flex_ws_api to call the DocumentService as in the following code listing. Note that the process calls wwv_flow_utilities.url_decode2 to decode the folder id, which we needed to encode on the prior page, because it was being passed as part of the link. The response is stored in a collection called GETDOCUMENTS_RESPONSE. The next thing to do is the create a report region that reports on the results of the web service much like page one. See the code listing. Finally, create a hidden item on page two called P2_FOLDER_ID for the folder id. At this point, you should be able to run the application, see a list of folders, click on a folder, and see the contents of the folder. The response from calling the DocumentService GetDocumentsInFolder operation is not only a listing of the documents there but also the data of the documents encoded in base64. Luckily, we can now convert the base64 clob into a blob which allows us to create another page in the application which will download the document. 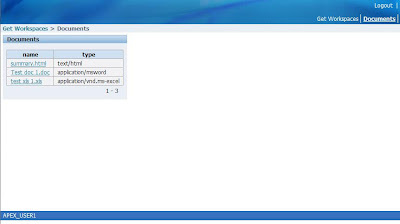 Create a new blank page (3) in the application. Create an empty HTML region to hold a hidden item for the document ID. Create a hidden item on page 3 called P3_DOCUMENT_ID. Now create a before header process that will parse the response of GetDocumentsInFolder and determine the size, mime type, name and base64 encoded data. Convert the base64 encoded data to a blob, and then use wpg_docload.download_file procedure to download the file. Use the code in the following listing to create the process. The final step is to modify the report attributes of the report region on page 2, hide the id column and link the name column to page 3, populating the P3_DOCUMENT_ID item like you did on page one for the link from the folder name. Once you have completed this step, you will have a simple three page application the shows a list of folders of workspaces that the currently logged in user belongs to, shows the contents of the folders when click on, and then downloads the document when clicked on.